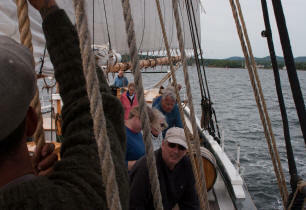 The five-day windjammer sail off the coast of Maine on the Grace Bailey was wonderful. The Grace Bailey is a two-masted schooner built in 1882, has had two restorations, one of which was in 1990, is 123 feet overall and accommodates 29 passengers. Twenty four club members sailed with Captain Ray Williamson and his crew, who did everything they could to feed and entertain us. 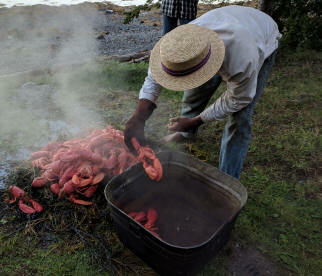 The trip featured a lobster bake ashore, nightly anchoring in quiet coves, and unforgettable views of the Maine coast. 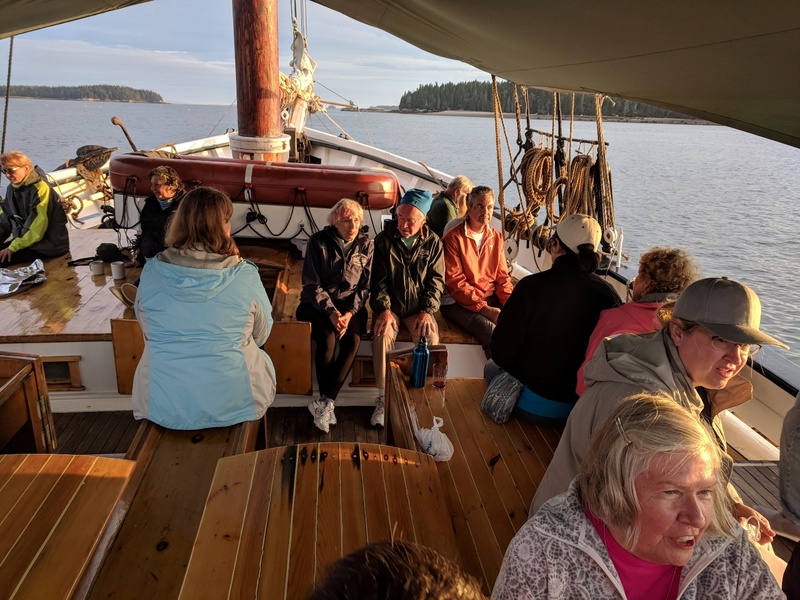 We boarded on Sunday evening at 5:30 and departed from Camden, Maine on Monday morning after breakfast into a nippy cool breeze. All three hearty daily meals were cooked on a wood-fired cast iron stove in the galley. This was also the only source of heat and hot water for the boat. Fresh baked breads were a treat at every meal. Our first night's destination was a secret, mostly because of the vagaries of wind and weather. This just heightened our excitement as we left Camden. Along the way, we have our first chance to help the crew raise sail. It only took twenty of us! At day's end we arrive in Buck's Harbor, our home for the next two days, with the anticipation of rain starting around midnight and continuing on as a heavy rain all day Tuesday. 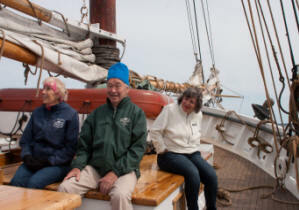 On Tuesday afternoon as the rain began to let up some of us ventured up on deck to see other schooners hiding out with us, and we caught sight of an eagle diving and catching a fish. A few also went ashore to do a little exploring, before returning to the warmth of the ship. 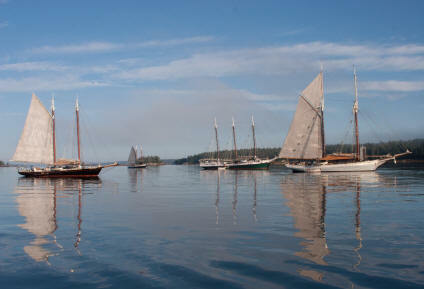 Wednesday was gloriously clear and festival day at Brooklin, Maine for Wooden Boat Day, a gathering of classic wood vessels hosted by the Wooden Boat School. There were about nine other schooners at anchor with us for this celebration. I spotted the Victory Chimes, the Mercantile and the American Eagle. All participants went ashore to visit the Wooden Boat School and were treated to steamed mussels, cheese and apple cider. 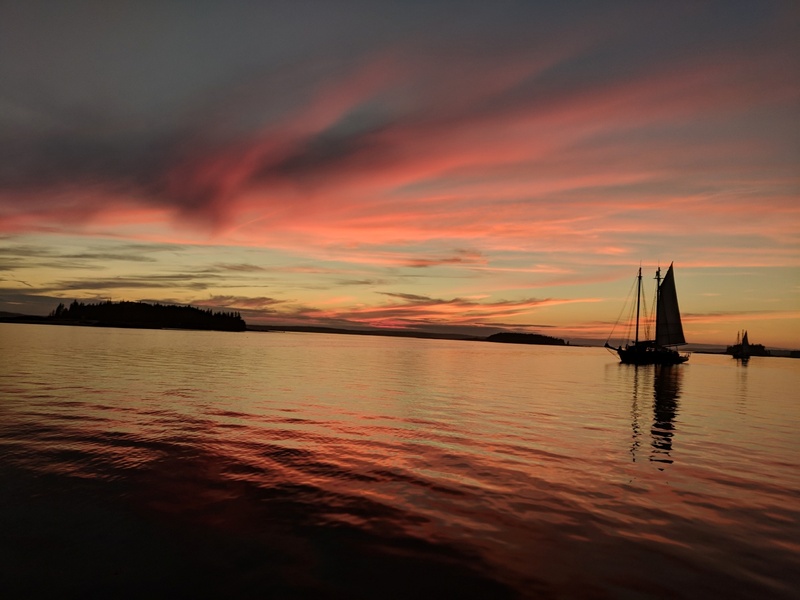 After another evening of fun and games, we anticipated Thursday morning's sail in beautiful sunny weather to Warren Island State Park where we would be treated to a lobster bake on shore, with fresh corn on the cob, veggies, marshmallows and S'mores.. The sail to Warren was picture perfect – sunny, breezy and an added treat of our resident accordion player (Hank Jelinek) on deck. The lobsters were obtained the day before from a lobster boat pulling up his traps. They don’t get any fresher than that. 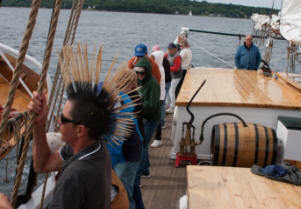 The launch ride back to our schooner was also a photo op. The sun had gone down behind the distant mountains and there was a red, pink, yellow back-light to the mountains. The next day being Friday meant we would be heading back to Camden after breakfast. It was great getting to know the new people in the club and spending fun time sailing with friends we have known for years.